As Cuba remodels a free-trade port is it also building an economic bridge to the United States? 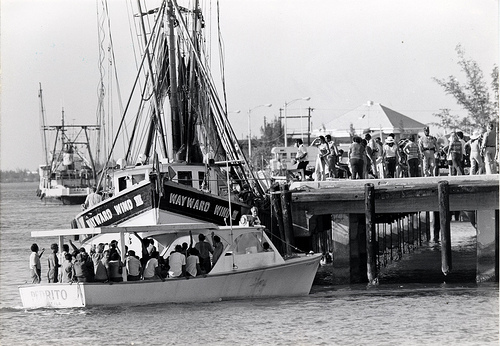 Cubans in Key West during the events of the 1980 Mariel Boatlift. Photo: Florida Keys Public Libraries. The Latin American giant Brazil, to the rhythm of Samba and dollars, is making its inexorable advance on our little island in the Caribbean in order to create the Integral Special Development Zone, a window to the future 30 miles west of Havana, in Mariel Port. The “Special Development Zone,” is a 180-square mile agro-industrial complex that is the biggest of a series of free-trade areas planned by the Cuban government to promote exports. Is it worth-while to focus on the last images and letters coming from the inside of the last living utopia on Earth? Is Cuba by now a contemporary country or just another old-fashioned delusion in the middle of Nowhere-America? A Cold-War Northtalgia maybe? Can we expect a young Rewwwolution.cu within that Ancien Régime still known as The Revolution? I would like to provoke more questions than answers. Orlando Luis Pardo Lazo was born in Havana City and still resides and resists there, working as a free-lance writer, photographer and blogger. He is the author of Boring Home (2009) and is the editor of the independent opinion and literary e-zine Voces. According to Rodrigo Malmierca, the Cuban Minister of Foreign Investment and Business, the first phase of construction will be complete in April 2013. It is estimated that investment in the project will be around 900 million dollars, of which Brazil will cover 640 million. The Odebrecht group, the largest Brazilian construction and engineering firm, is involved, and Brazilian President Dilma Rousseff came to Cuba in January 2012 to check on this super-project in person. PSA Singapore will also be one of the main stakeholders. The Cuban company that has partnered with the Odebrecht group for this project is The Mariel Development Zone. Like almost everything in ‘official’ Cuba, it’s a subsidiary of Cuban State military enterprises: In this case it’s part of Almacenes Universales S.A. If one day Washington’s commercial embargo against the Havana government is finally lifted, this bay will no doubt be the bridge that will finally bring both nations closer together—after more than half a century of isolation, political animosity, and the consequent suffering of a Cuban family, divided by geography, but never in its heart.